Spider veins and varicose veins are both problems that cause visible issues on the surface of skin. Both are most likely to show up on your legs thanks to gravitational pull that makes it difficult for sluggish blood to make it back to your heart. These venous problems are also typically related to problems within the veins themselves. Venous valves, which are special one-way valves that are supposed to keep blood from flowing backwards, may have trouble closing as veins bulge outward, and this may also contribute to the problem. The differences between spider veins and varicose veins are found mainly in their size and in the extent of problems that they cause. Spider veins are usually very narrow and look like small circular patterns of red, blue or purple on your skin. They also generally cause only cosmetic problems. While they are most often found on the legs, they can also show up within thinner skin of the face at times. 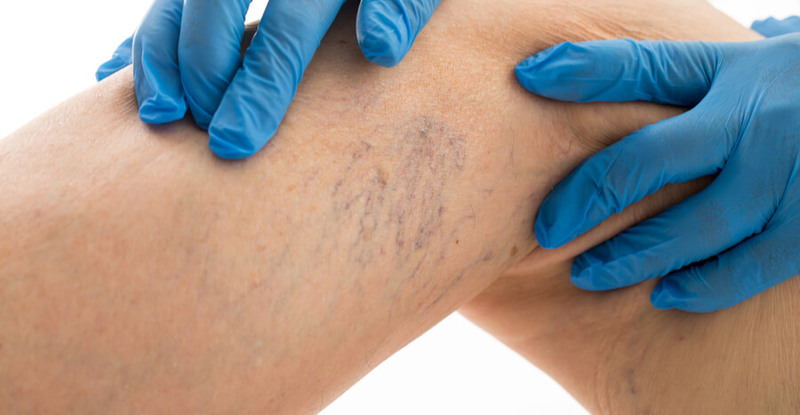 On the other hand, varicose veins are quite a bit larger and may even appear bumpy or ropey on the surface of your skin. They are most frequently found on the lower legs and especially like to congregate behind the knees. While they can cause a great deal of embarrassment, they can also cause you physical issues, such as discomfort, cramping and itching skin. The gold standard of therapy for both spider veins and varicose veins is sclerotherapy. This minimally invasive treatment only requires a small injection with a needle into the main problematic vein, often called the feeder vein, into which many of the smaller visible veins pool. Sclerotherapy is usually the best choice for larger spider veins that cannot be treated with lasers and for small to moderate-sized varicose veins that do not require more aggressive treatment. During your sclerotherapy treatment, the skin around the treatment area will be numbed shortly before your treatment begins. Once you are perfectly comfortable, your practitioner will carefully inject the feeder vein using a strong solution that is designed to irritate the vein walls. With traditional sclerotherapy, the irritated vein walls swell shut, also cutting off the blood supply. When blood can no longer flow through these veins, they die and are gradually reabsorbed by your body. Therefore, within the next two to three months, you will see these veins fade away from your skin. Sclerotherapy is a permanent solution to a trying problem. If lifestyle changes are not working and you are embarrassed by or physically uncomfortable with your spider veins or varicose veins we here at Rejuveination located in Cincinnati, OH. can help. Contact us today and schedule your consultation!